The SPC JounceShock is a patented form of bump shock that will maximize the capacity and performance of your suspension. The nitrogen charged secondary shock adds additional compression damping and controlled rebound to your vehicle’s system. The result is: exponential suspension bottoming protection, increased stability and handling at all speeds, and reduced stress and loads for both the vehicle and driver. We have pre-made systems for some of the most popular off road vehicles in the market. 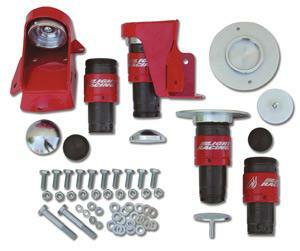 With these complete systems it is easy to get the benefits of a JounceShock system into your truck. Systems include everything you need from custom mounts to the nuts and bolts and detailed instructions.